I have a very different approach to shoes than most people. My experience has been that expensive athletic shoes today, for the most part, may seem scientific and modern, but they do not work well with the functionality of the body. In fact, they force the body into bad habits which can cause all sorts of problems. But, to be specific and for the purpose of this article, yes… most modern athletic shoes do, in my opinion, significantly increase the risks of sprained ankles. Your feet have lots of their own padding, especially the balls of your feet. Your heel has less padding, which means that when you walk and run, you should try to land more on the balls of your feet first. You should NOT be pounding on your heels! Go ahead and try both styles on hard wood, cement or some other hard surface. You will quickly see that landing on the balls of your feet feels natural and good, while landing on the heels feels jarring and bad, especially on the knees, hips and low back. Thick soled shoes are designed to make you comfortable, but they are like a high wire for your ankles. You are raising your ankles higher and higher off the ground, which puts your ankles in a very precarious position. If your ankles are high off the ground, it is much easier to twist them without much force… AND, since they are higher off the ground, there is more room for the ankles to keep twisting and twisting, which will make the injury far worse, than if your ankles were closer to the ground. In fact, When I put on a pair of thick soled athletic shoes, I feel like I am wearing platform shoes, because they are so high and I am used to my feet being in much closer contact with the ground. It really does NOT feel natural or good to me at all. To me, it’s like drinking soda versus water. At first, water might seem plain and boring, but if you stop drinking soda for a while and just drink water, it is amazing how your health can transform just from that one simple change. Then, months later, if you try soda again, it will taste totally different to you. What tasted great before, may not taste so good now… You may realize how sugary sweet and unnatural it tastes… Water just hits the spot (and of course, it is the healthiest option too!). Sorry, I got off topic… The point is that just because you are used to something, does not necessarily make it good for you! Back to thick soled shoes… they force you to lose touch with the variable nature of the ground. In other words, almost everything feels like a smooth ride on your feet. That’s not good either, because what makes your ankles strong over time, is the challenge of unstable ground. If everything is just smooth and straight, your muscles get used to a very simple movement which is not good is you ever hit something unstable (i.e. you trip, step on a rock, foot, crack in the sidewalk, etc.). The thick heels of the modern athletic shoe make your ankles weaker over time, because you are not walking the way you are supposed to walk. You will end up walking on your heels, which means the balls of the feet and the ligaments around the ankle are not properly engaged. The weaker your ankles get, the higher the chance of an ankle sprain, because they have diminished natural strength and stability. The thick heels also raise your ankles high off the ground. 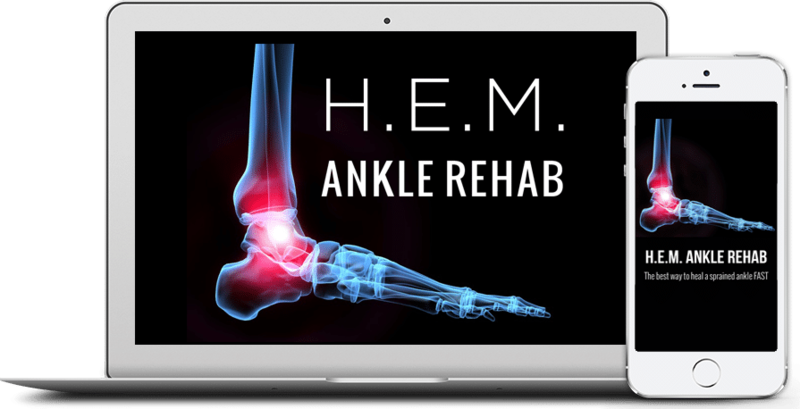 As you force your ankle higher off the ground, it is MUCH EASIER to sprain your ankle. Go to a shoe store and try thin and thick soled shoes and you will immediately see what I mean. So, what do I recommend instead? Thin soled shoes that are still very comfortable for your feet. The truth is that you don’t have to give up comfort!! There is a wide selection of light-weight, flexible and thin soled shoes that will be very comfortable and help strengthen your ankles naturally over time, because they allow you to walk and run the way you were meant to… (on the balls of your feet)! You may find that thin soled shoes actually change the way you walk and that would probably be a great thing for you! You can start walking more on the balls of your feet and that will not only help your ankles, but also your knees, hips and low back. Your ankles will become more stable and strong and if you do trip over something, then your ankles will be lower to the ground and more capable of withstanding that twisting force. In my case, I find that my ankle can actually twist (in the case of mildly tripping, etc. ), and it just comes right back and I feel no pain and have no injury. That is how your ankles should work if you allow them some freedom to function naturally in thin soled, flexible and lightweight shoes.